↑ 2.0 2.1 "What Are Taste Buds?". kidshealth - Nemours Foundation. ↑ 6.0 6.1 Kean, Sam (Fall 2015). "The science of satisfaction". Distillations Magazine. 1 (3): 5. สืบค้นเมื่อ 2016-12-02. ↑ "How does our sense of taste work?". PubMed. 2012-01-06. สืบค้นเมื่อ 2016-04-05. ↑ "10". Human Physiology: An integrated approach (5th ed.). Silverthorn. p. 354. ↑ Rosenthal, Andrew J (1999). Food texture: measurement and perception. Springer. pp. 3, 36. ↑ Miller, Greg (2011-09-02). "Sweet here, salty there: Evidence of a taste map in the mammilian brain". Science. 333 (6047): 1213. doi:10.1126/science.333.6047.1213. ↑ Scully, Simone M. "The Animals That Taste Only Saltiness". Nautilus. สืบค้นเมื่อ 2014-08-08. ↑ 24.0 24.1 Schacter, Daniel (2009). Psychology (2nd ed.). United States of America: Worth Publishers. p. 169. ISBN 978-1-4292-3719-2. ↑ Ikeda, Kikunae (2002) [First published 1909]. "New Seasonings" (PDF). Chemical Senses. 27 (9): 847–849. doi:10.1093/chemse/27.9.847. PMID 12438213. สืบค้นเมื่อ 2007-12-30. ↑ Lindemann, Bernd (2001-09-13). "Receptors and transduction in taste" (PDF). Nature. 413 (6852): 219–225. doi:10.1038/35093032. PMID 11557991. สืบค้นเมื่อ 2007-12-30. ↑ 29.0 29.1 Oaklander, Mandy (2015-07-28). "A New Taste Has Been Added to the Human Palate". TIME. สืบค้นเมื่อ 2015-08-04. 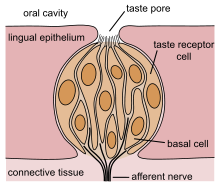 ↑ "How the Taste Bud Translates Between Tongue and Brain". New York Times. 1992-08-04. ↑ 37.0 37.1 37.2 37.3 37.4 37.5 McLaughlin S.; Margolskee R.F. (1994). "The Sense of Taste". American Scientist. 82 (6): 538–545. ↑ Glendinning, J. I. (1994). "Is the bitter rejection response always adaptive?". Physiol Behav. 56 (6): 1217–1227. doi:10.1016/0031-9384(94)90369-7. PMID 7878094. ↑ Wang, X. (2004). "Relaxation Of Selective Constraint And Loss Of Function In The Evolution Of Human Bitter Taste Receptor Genes". Human Molecular Genetics. 13 (21): 2671–2678. doi:10.1093/hmg/ddh289. PMID 15367488. ↑ Meyerhof (2010). "The molecular receptive ranges of human TAS2R bitter taste receptors". Chem Senses. 35 (2): 157–70. doi:10.1093/chemse/bjp092. PMID 20022913. ↑ Wiener (2012). "BitterDB: a database of bitter compounds". Nucleic Acids Res. 40 (Database issue): D413–9. doi:10.1093/nar/gkr755. PMC 3245057. PMID 21940398. "Umami, savory 'fifth taste,' now available in a tube in grocery stores". New York: NY Daily News. 2010-02-09. สืบค้นเมื่อ 2011-01-01. "Cambridge Advanced Learner's Dictionary". Cambridge University Press. สืบค้นเมื่อ 2011-01-01. ↑ 54.0 54.1 "Merriam-Webster English Dictionary". Merriam-Webster, Incorporated. สืบค้นเมื่อ 2011-01-01. ↑ 57.0 57.1 "Umami culture around the world". Umami Information Center. Archived from the original on 2018-01-24. สืบค้นเมื่อ 2018-04-09. ↑ "旨味 definition in English". Denshi Jisho—Online Japanese dictionary. Archived from the original on 2018-04-09. สืบค้นเมื่อ 2018-04-09. ↑ 60.0 60.1 60.2 "Umami Food Ingredients". Japan's Ministry of Agriculture, Forestry and Fisheries. 2007. Archived from the original on 2017-08-16. ↑ "Auguste Escoffier and The Essence of Taste". Columbia University. Archived from the original on 2017-12-29. ↑ "Fish Sauce An Ancient Roman Condiment". 2013-10-26. Archived from the original on 2017-10-14. ↑ 87.0 87.1 Quality control methods for medicinal plant materials, Pg. 38 World Health Organization, 1998. ↑ "Spice Pages: Sichuan Pepper (Zanthoxylum, Szechwan peppercorn, fagara, hua jiao, sansho 山椒, timur, andaliman, tirphal)". Archived from the original on 2017-09-15. ↑ "Types of Tastes in Ayurveda". Archived from the original on 2007-10-08. ↑ "Is there a Battery in your Mouth?". www.toothbody.com. Archived from the original on 2012-02-28. สืบค้นเมื่อ 2012-02-10. ↑ Riera, Céline E.; Vogel, Horst; Simon, Sidney A.; le Coutre, Johannes (2007). "Artificial sweeteners and salts producing a metallic taste sensation activate TRPV1 receptors". American Journal of Physiology. pp. R626–R634. doi:10.1152/ajpregu.00286.2007. PMID 17567713. สืบค้นเมื่อ 2012-02-10. ↑ Willard, James P. (1905). "Current Events". Progress: A Monthly Journal Devoted to Medicine and Surgery. 4: 861–68. ↑ Monosson, Emily (2012). Evolution in a Toxic World: How Life Responds to Chemical Threats. Island Press. p. 49. ISBN 9781597269766. ↑ 99.0 99.1 Goldstein, E. Bruce (2010). Encyclopedia of Perception. 2. SAGE. pp. 958–59. ISBN 9781412940818. ↑ Levy, René H. (2002). Antiepileptic Drugs. Lippincott Williams & Wilkins. p. 875. ISBN 9780781723213. ↑ Stellman, Jeanne Mager (1998). Encyclopaedia of Occupational Health and Safety: The body, health care, management and policy, tools and approaches. International Labour Organization. p. 299. ISBN 9789221098140. ↑ "Like the Taste of Chalk? You're in Luck--Humans May Be Able to Taste Calcium". Scientific American. 2008-08-20. สืบค้นเมื่อ 2014-03-14. ↑ "Potential Taste Receptor for Fat Identified". Scientific American. 2005-11-02. ↑ Laugerette, F; Passilly-Degrace, P; Patris, B; Niot, I; Febbraio, M; Montmayeur, J. P.; Besnard, P (2005). "CD36 involvement in orosensory detection of dietary lipids, spontaneous fat preference, and digestive secretions". Journal of Clinical Investigation. 115 (11): 3177–84. doi:10.1172/JCI25299. PMC 1265871. PMID 16276419. ↑ Dipatrizio, N. V. (2014). "Is fat taste ready for primetime?". Physiology & Behavior. 136C: 145–154. doi:10.1016/j.physbeh.2014.03.002. PMC 4162865. PMID 24631296. ↑ Baillie, A. G.; Coburn, C. T.; Abumrad, N. A. (1996). "Reversible binding of long-chain fatty acids to purified FAT, the adipose CD36 homolog". The Journal of membrane biology. 153 (1): 75–81. doi:10.1007/s002329900111. PMID 8694909. ↑ Simons, P. J.; Kummer, J. A.; Luiken, J. J.; Boon, L (2011). 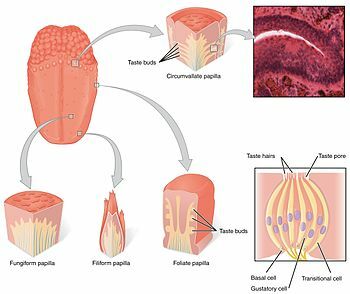 "Apical CD36 immunolocalization in human and porcine taste buds from circumvallate and foliate papillae". Acta Histochemica. 113 (8): 839–43. doi:10.1016/j.acthis.2010.08.006. PMID 20950842. ↑ 111.0 111.1 Mattes, R. D. (2011). "Accumulating evidence supports a taste component for free fatty acids in humans". Physiology & Behavior. 104 (4): 624–31. doi:10.1016/j.physbeh.2011.05.002. PMC 3139746. PMID 21557960. ↑ Pepino, M. Y.; Love-Gregory, L; Klein, S; Abumrad, N. A. (2012). "The fatty acid translocase gene CD36 and lingual lipase influence oral sensitivity to fat in obese subjects". The Journal of Lipid Research. 53 (3): 561–6. doi:10.1194/jlr.M021873. PMC 3276480. PMID 22210925. ↑ Cartoni, C; Yasumatsu, K; Ohkuri, T; Shigemura, N; Yoshida, R; Godinot, N; Le Coutre, J; Ninomiya, Y; Damak, S (2010). "Taste preference for fatty acids is mediated by GPR40 and GPR120". Journal of Neuroscience. 30 (25): 8376–82. doi:10.1523/JNEUROSCI.0496-10.2010. PMID 20573884. ↑ Liu, P; Shah, B. P.; Croasdell, S; Gilbertson, T. A. (2011). "Transient receptor potential channel type M5 is essential for fat taste". Journal of Neuroscience. 31 (23): 8634–42. doi:10.1523/JNEUROSCI.6273-10.2011. PMC 3125678. PMID 21653867. ↑ Running, Cordelia A.; Craig, Bruce A.; Mattes, Richard D. (2015-07-03). "Oleogustus: The Unique Taste of Fat". Chemical Senses. 40 (6): 507–516. doi:10.1093/chemse/bjv036. สืบค้นเมื่อ 2015-08-03. ↑ Neubert, Amy Patterson (2015-07-23). "Research confirms fat is sixth taste; names it oleogustus". Purdue News. Purdue University. สืบค้นเมื่อ 2015-08-04. ↑ Feldhausen, Teresa Shipley (2015-07-31). "The five basic tastes have sixth sibling: oleogustus". Science News. สืบค้นเมื่อ 2015-08-04. ↑ 118.0 118.1 Hettiarachchy, Navam S.; Sato, Kenji; Marshall, Maurice R., eds. (2010). Food proteins and peptides: chemistry, functionality interactions, and commercialization. Boca Raton, Fla.: CRC. p. 290. ISBN 9781420093414. สืบค้นเมื่อ 2014-06-26. ↑ Lapis, Trina J.; Penner, Michael H.; Lim, Juyun (2016-08-23). "Humans Can Taste Glucose Oligomers Independent of the hT1R2/hT1R3 Sweet Taste Receptor" (PDF). Chemical Senses (in อังกฤษ). 41: bjw088. doi:10.1093/chemse/bjw088. ISSN 0379-864X. PMID 27553043. ↑ Pullicin, Alexa J.; Penner, Michael H.; Lim, Juyun (2017-08-29). "Human taste detection of glucose oligomers with low degree of polymerization". PLOS ONE. 12 (8): e0183008. doi:10.1371/journal.pone.0183008. ISSN 1932-6203. ↑ Hamzelou, Jessica (2016-09-02). "There is now a sixth taste - and it explains why we love carbs". New Scientist (in อังกฤษ). สืบค้นเมื่อ 2016-09-14. ↑ Norton, N (2007). Netter's head and neck anatomy for dentistry. illustrations by Netter FH. Philadelphia, Pa.: Saunders Elsevier. p. 402. ISBN 1929007884. ↑ Gardner, Amanda (2010-06-16). "Love salt? You might be a 'supertaster'". CNN Health. สืบค้นเมื่อ 2012-04-09. ↑ Walker, H. Kenneth (1990). "Clinical Methods: The History, Physical, and Laboratory Examinations". สืบค้นเมื่อ 2014-05-01. ↑ Bachmanov, AA. ; Beauchamp, GK. (2007). "Taste receptor genes". Annu Rev Nutr. 27 (1): 389–414. doi:10.1146/annurev.nutr.26.061505.111329. PMC 2721271. PMID 17444812. ↑ Deshpande, D. A.; Wang, W. C. H.; McIlmoyle, E. L.; Robinett, K. S.; Schillinger, R. M.; An, S. S.; Sham, J. S. K.; Liggett, S. B. (2010). "Bitter taste receptors on airway smooth muscle bronchodilate by localized calcium signaling and reverse obstruction". Nature Medicine. 16 (11): 1299–1304. doi:10.1038/nm.2237. PMC 3066567. PMID 20972434. Chaudhari, N; Roper, SD (2010). "The cell biology of taste". J. Cell Biol. 190 (3): 285-96. doi:10.1083/jcb.201003144. PMC 2922655. Saladin, KS (2010a). "16.3 The Chemical Senses". Anatomy and Physiology: The Unity of Form and Function (5th ed.). New York: McGraw-Hill. pp. 595-597 (611-613). ISBN 978-0-39-099995-5. "The Science of taste". Kitchen Geekery. An informative article about the science behind taste. Written from a culinary science perspective. หน้านี้แก้ไขล่าสุดเมื่อวันที่ 4 มกราคม 2562 เวลา 20:51 น.